Please refer to our stock # 10855 when inquiring. 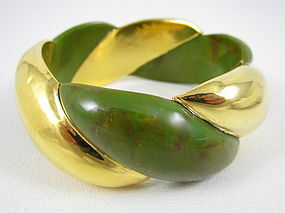 This wonderful bracelet is a great example of hard to find bakelite "clad" jewelry. It is 1 1/4" wide with a 2 1/2" diameter opening and has a rope twist design in carved mottled olive green bakelite. What makes this bangle unique are the alternating panels of gold plate, or "clad" which. There is some minor surface wear on the clad panels, but overall, the bracelet is in very good condition.